WORLDWIDE: With the operation and maintenance of offshore wind farms accounting for a quarter of the industry's levelised cost of energy, opting for the most cost-efficient system of staff and component transfer has become a crucial issue. Getting technicians safely from vessel to wind turbine for maintenance and other operations numbers among the many issues to be tackled in the offshore wind sector. The transfer of staff and substantial components for repairs and maintenance is also a task that can be held up by inclement weather conditions causing costs to escalate. With operations and maintenance accounting for about a quarter of offshore wind's levelised cost of energy (LCOE), controlling the cost of transferring staff and components to turbines without compromising safety is vital to the overall viability of the industry. The LCOE is the price per MWh that results when all costs of building and operating the project during its lifetime are set against the total net electricity generated. This effectively shows what the price of electricity has to be for an offshore wind farm to break even. But assessing which system is most efficient for the transfer of staff and small components from vessel to turbine and back is far from easy. Detailed analysis now goes far beyond what might be considered the most obvious determining factors of project size and location, and weather and wave conditions. Dutch research centre ECN, which specialises in offshore operation and maintenance (O&M), has closely examined various access strategies to find out which are best suited to the far-shore sites where the next generation of offshore wind farms will be installed. The small catamaran-type workboats typically used for transfers nearer shore may no longer be the most economic option when distances to harbour reach 40 kilometres and beyond, and the weather conditions pose greater challenges. In a recent study, ECN analysed new options such as catamaran-like boats equipped with facilities to hold and steady the vessel at the turbine, larger vessels with a compensated access gangway installed on board and mother vessels acting as a harbour for smaller craft used to transfer staff and components, as well as the use of helicopters. ECN's OMCE Calculator software is designed to help operators of wind farms determine the optimal O&M strategy during the advanced planning and operational phase of a wind farm. It is programmed for a broad approach, looking not just at individual tasks but at the complete spectrum of faults and failures that occur outside scheduled preventive and corrective maintenance. A wide range of data inputs are used, including component failure rates, maintenance and repair strategies, wind and wave statistics, lead-time for vessels availability and supply of spare parts. Looking at offshore wind farms with 80 and 150 turbines, located 85 kilometres and 115 kilometres from shore respectively, as well as an 80-turbine facility 35 kilometres from shore, ECN found that using a compensated access gangway for transfer of both technicians and components up to a wave height of three metres appears to make the most sense. The simulations show this system results in high availability of turbines (93-95%) and low average annual costs of repairs per turbine of EUR0.35-0.45 million. The ability to transfer small spare parts as well as technicians is "crucial", concluded ECN, because the alternative transfer of parts from vessel to turbine using the turbine's platform crane is highly dependent on weather conditions. ECN also found that for projects far from shore, a mother vessel with a compensated access gangway could be considered, although here too the capacity to transfer both staff and parts is vital for a high turbine availability. The work was partly funded by Z-Technologies, also a collaborator in the work, and carried out as part of the Dutch government's TKI Wind op Zee programme, launched in mid-2013 with a goal of reducing the cost of offshore wind by 40% by 2020 compared with 2010. Z-Technologies' prototype Z-Bridge, an access system for transfer of staff and materials, will be ready on a vessel for testing in autumn 2014, the company says. But its floating harbour, a kind of mothership concept, is still at an early stage of development, according to managing director Reinout Prins. Other companies offering compensated access gangway technology include Ampelmann, which in November 2013 acquired competitor Dutch company Offshore Solutions and its hydraulically operated heave compensated gangway technology. Elsewhere, UK-based firms BMT Group and Houlder have worked together to develop a Turbine Access System (TAS), which is described as a lightweight, heave compensated gangway system. Uptime international also offers an active motion compensated gangway that is 19.4 metres long and can be extended or reduced by four metres, a 12-metre telescopic version and an eight-metre prototype. "From our perception, current gangway systems are not designed to easily transfer loads up to 1,000 kilogrammes," says O&M specialist at ECN, Tom Obdam. "However, with turbines getting larger this has to change, as gangway system developers are aware." The ECN study found the ability to transfer technicians and small components at wave heights of up to three metres seems to be the optimum. Raising the limit to 3.5 metres produced only small gains in revenues, but lowering it to 2.5 metres meant downtime and associated revenue losses increase significantly. For spare parts alone, a wave height limit below two metres increases costs significantly. In the near future, ECN's software will be extended to include other parameters, including wave period and direction, as well as tides and currents, to establish the exact range of conditions under which technicians and small parts can make the vessel-turbine transfer. The access systems workstream of UK Carbon Trust's Offshore Wind Accelerator (OWA) Program is also using a combination of metocean conditions beyond wave height to feed into its research work. 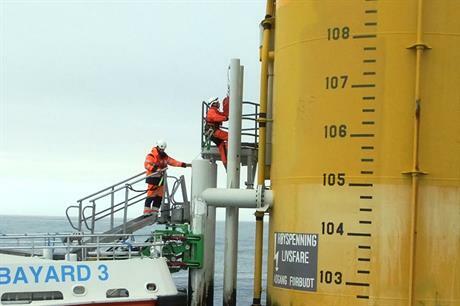 The OWA is working in cooperation with offshore certification body DNV-GL to develop sea trial procedures to assess vessel performance and evaluate factors such as transit from shore and turbine approach and transfer in different metocean and weather conditions. It aims to find out whether vessels can live up to their promise in real conditions. The aim is to identify the best vessels and transfer systems for a particular site, assess how the design matches up in real performance, increase reliability of O&M modelling and set out minimum expected vessel and transfer system performance standards. This is also expected to help when drawing up vessel contracts and addressing the liabilities involved. Marc Costa Ros, who is managing the OWA access systems workstream, says a summary report should be completed within the next few months.